Another setting of a poem by A.E. Housman. A Shropshire Lad VIII is untitled, but I call it Farewell to Severn Shore rather than by its first line, which seems a little unwieldy as a title. Compared to ‘The Carpenter’s Son’ the guitar part is much more ‘conventional folkie’. The original poem below is as published on Martin Hardcastle’s site here. ‘Tis time the field were mown. This entry was posted in David Harley on March 23, 2014 by David Harley. Words by A.E. Housman, musical setting by David Harley, copyright 1977. All rights reserved. This entry was posted in David Harley, Housman settings and tagged Carpenter's Son on March 22, 2014 by David Harley. I have a history of being almost there in the music and recording world. Back in the 60s, the organizer of something I played at in Bayston HIll or thereabouts was photographed for a local paper playing (or pretending to play) my guitar (I guess that would have been the Hofner). In the ’70s, Wayland Smithy recorded something or other using my Gretsch Anniversary. (I should never have parted with that guitar…) In the 80s I had several songs on an album that was never released because of a contract issue with one of the other guys. My three tracks are here, though. 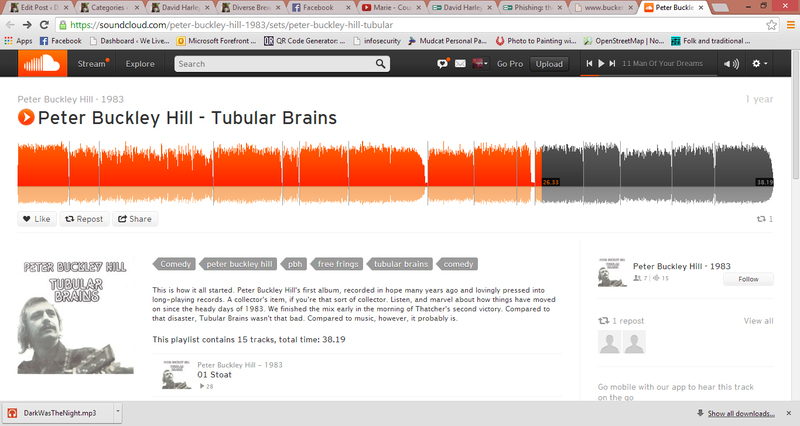 And I was involved with some other recording projects that were a little more successful (including some of the recordings on this site, hopefully), though I’m not sure whether I should include Peter Buckley Hill’s Tubular Brains in that category in view of Peter’s high opinion of it. 😉 OTOH there are some bits of Harley guitar in there I still quite like, having heard those tracks again for the first time in at least 20 years. Anyway, in the next two decades I had other things on my mind, like parenting and IT security (not to mention job security). However, a month or two ago, I was promoted to body part double for a video by the pseudonymous Virge Clenthills, a well-known C&W name in Ludlow and environs. Not only does it show one of my guitars, but my actual fingers, complete with Virge’s enormous rings. Which would have been a little awkward if I hadn’t been miming. Not quite overnight success. And I guess if I’m going to get any more music of my own Out There, I’ll have to take Peter Gabriel’s advice and carry on D-I-Y-ing. This entry was posted in David Harley, Diverse Brew sessions, Parody and Pastiche, Peter Buckley Hill, Virge Clenthills and tagged Tubular Brains on March 10, 2014 by David Harley.